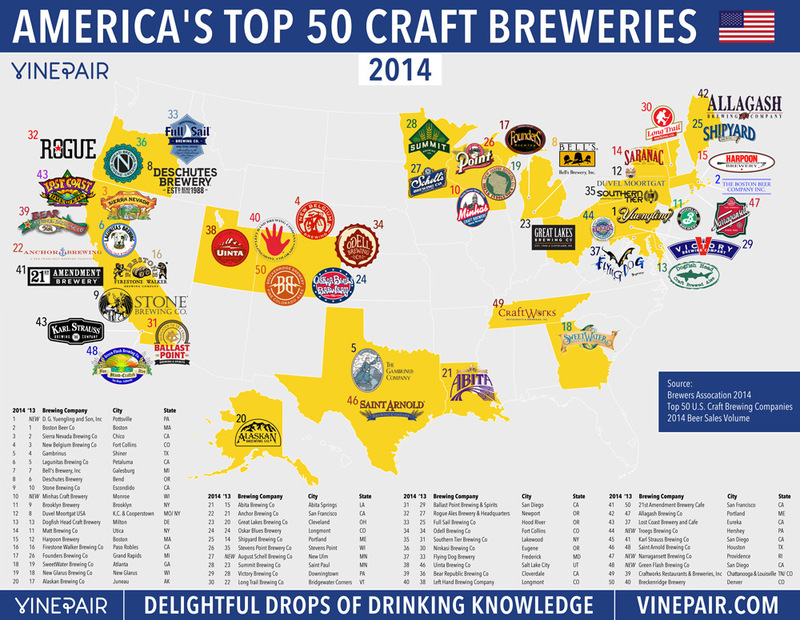 America’s top 50 craft breweries for 2014 have been revealed and the results are fascinating. Explore our map of all the ranking breweries (including 2013 ranks for comparison) — and then read our favorite facts and findings below. The Brewers Association, who collect this data every year, offered us some insights into the big changes to this year’s list, starting with this year’s new top ranking brewer, Yuengling! California is the clear king of the rankings, holding down 11 spots. Colorado places second with 6 craft breweries (Craftworks is listed in both Colorado and Tennessee). Third place is a tie. Oregon has 4 breweries as does New York. Duvel Moortgat USA has long called Cooperstown home at Ommegang. 23 states are represented in the top 50. Missouri does not appear on the map but Duvel Moortgat USA (Ommegang) purchased Boulevard Brewing Company of Kansas City, MO in early 2014. San Diego has 4 of the top 50, counting Stone, which is located in Escondido, a city in San Diego County.